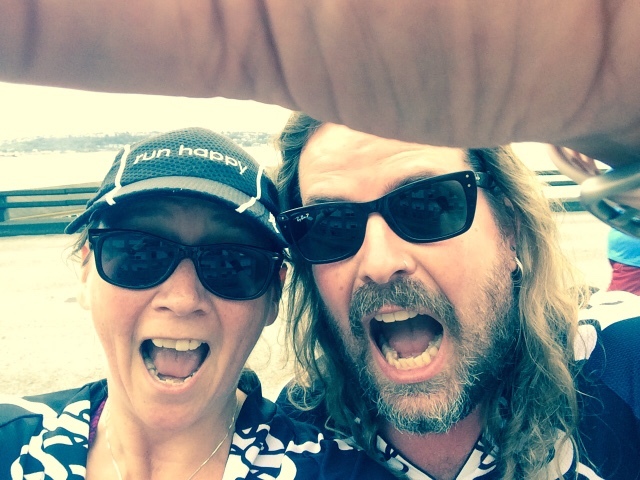 The Seafair Pirate Run -- let's face it, Seattleites are going to call it "Torchlight" for years to come -- is one of Seattle's classic running events. Run along the route of the city's beloved Torchlight parade, it's a chance to run down the street thronged with cheering spectators. I love running through the city, high-fiving kids, waving at princesses, sprinting away from clowns, and exchanging hearty "Arrrrrr! "s with pirates. And did I mention that it's traditional to run dressed as a pirate? 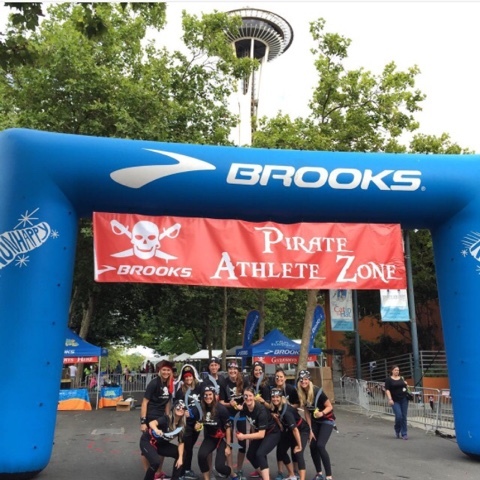 Brooks is a big sponsor of the event, so we are all encouraged to sign up to run or to volunteer. 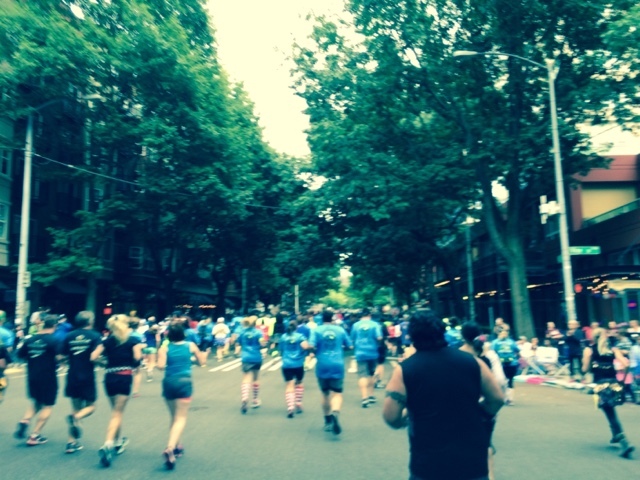 And this year's race was more fun than ever. 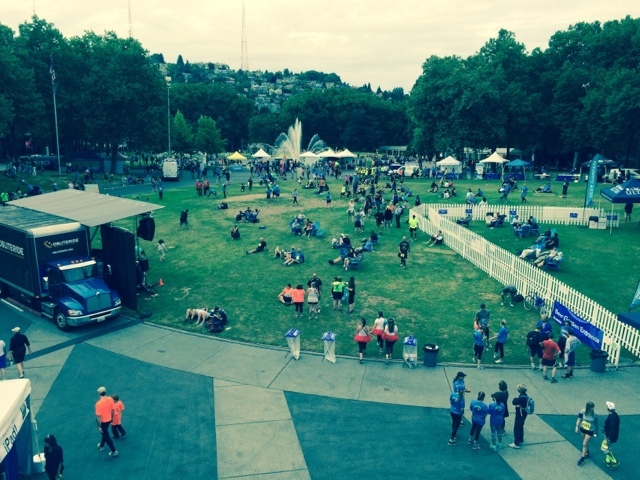 We arrived at the Seattle Center to find a happy atmosphere, complete with music stage. We, of course, had done our pre-func at T.S. McHugh's … because, well, tradition. We milled about a little -- bumping into a few other Brooksies, saying hi to the events gang, and admiring the pirate outfits. 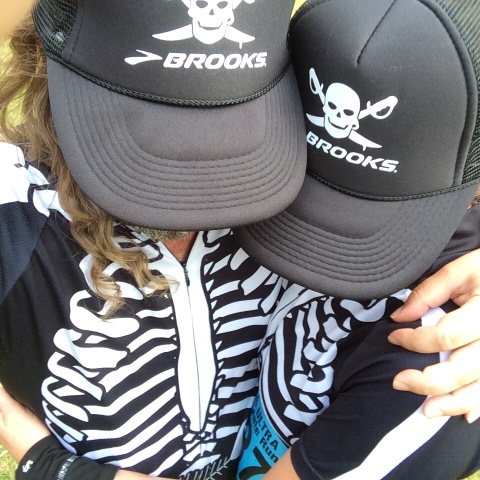 the Brooks events team -- arrrrr! We didn't really go overboard ourselves (pun intended!!!) 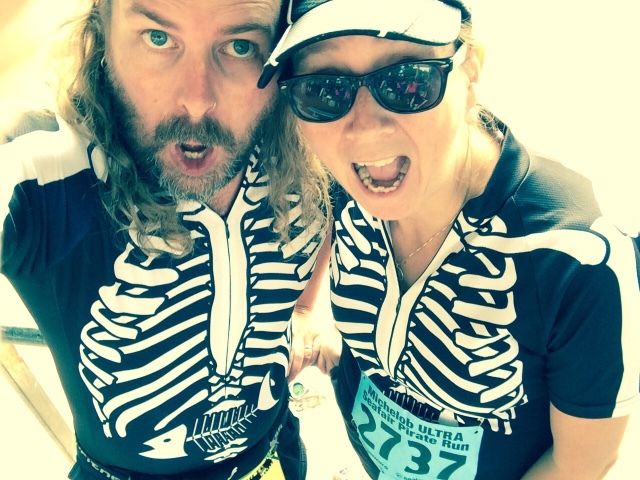 -- but we did wear our skeleton bike jerseys. We filtered into the start chute -- giggling when we heard the announcers encouraging runners who would be running a 6-minute mile or faster to get to the front. Ho ho ho. (Yo ho ho?) We were warned that the Seafair Pirates would be firing their cannon (okay, I can't resist noting that the website and promo emails both said they would be firing their 'canon'… which still makes me giggle, a little…). One thing the organizers could have done better was use the cannon fire as the starting pistol -- but instead it was 5 minutes before the start. C'mon, Seafair -- let's really start this race off with a bang next year!!! We ran into some friends in the starting chute, but managed NOT to take any pictures… but let me assure you that they were WAY more piratey than we were! The start felt a little funny -- we weren't very far back, but it took us over a minute to cross the starting mats… it took a while to get the people in front of us moving! But we started off down the hill (knowing that we would have to run up the hill at the end), and then made a few quick turns to end up on the parade route. This was taken toward the beginning of the route -- before I shifted over to the side for more HIGH-FIVIN' ACTION!!! Is there anything better than high-fiving kids along a race course? Kids got super excited when they could see you were running up to them… and not leaving them hanging. At one point I overheard a kid say "cool shirts! ", and his mom shouted "skeleton crew!" NICE. But soon it was time for my other favorite thing about this race -- running on top of the viaduct! We managed to take the worst viaduct photo in the history of viaduct photos. But, seriously, this is genuine run happiness!!! Quick aside, for full disclosure -- Wil was running in the place of our friend Ryan, who wasn't able to run. Ryan had registered for the 8K, while I had registered for the 5K. 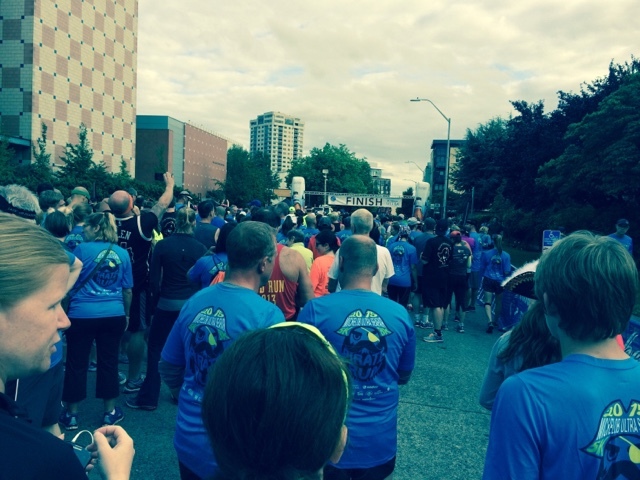 This caused a bit of consternation from friends we saw before the race: "But, you guys ALWAYS run together?!?" "Are you seriously going to split up during this race?" "Wait, WHAT?" As we were running along the viaduct our speedy pal David Kornfield came running up between us -- I think that, despite the horsing around, he came in 13th overall or something ludicrous like that. Speedy, speedy Korny. We made the turn onto the Big Dumb Hill and -- no shame here -- dropped to a walk. Later another friend would describe that stretch as essentially climbing on all fours, it felt so steep. But then another turn, and another, and it was time for the tiny little hill to the finish. We were woefully undertrained, a teensy bit dehydrated, and feeling less that perky, but we finished in a pretty satisfactory 32:03. 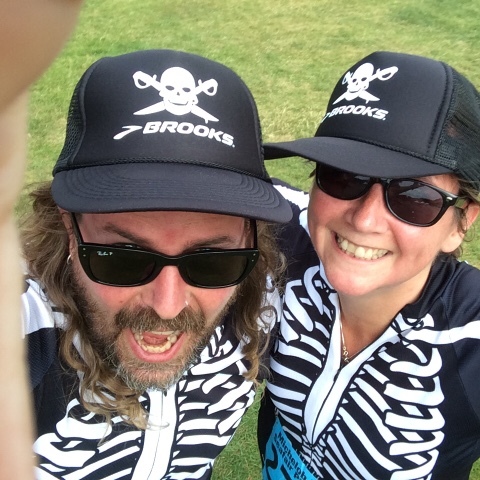 After finishing we entered the Pirate Athlete Zone… where, unbeknownst to me, Wil had flagged down a couple of the Brooksies and I was pelted with a Supersoaker. A lot. I believe Wil even used me as a human shield at one point. Awesome. We considered lingering -- could have had a free Michelob Ultra in the beer garden while listening to a local band… but instead we decided to just go back to McHugh's, where we walked in to surprised folks saying, "Oh, you're already DONE? Wow!" Nice. Thanks to everyone at Seafair and at Brooks for a fun race -- already looking forward to next year!